With the death of Franco, the Church had to revise his concordat and accept the loss of its religious monopoly. However, the new constitution was arranged so as to still give the Church a special status. (And no wonder, since the concordat, though signed later, was negotiated at the same time.) 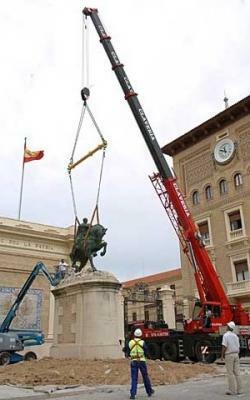 It proved easier to remove Franco's statue than the Church privileges that he helped entrench. The 1953 Concordat signed with the Vatican began with the following decree: "The Catholic, Apostolic and Roman religion, being the only religion of the Spanish nation, enjoys rights and prerogatives which are its due conforming to Divine and Canon Law." The Concordat granted the state the right to intervene in the alteration of ecclesiastical jurisdictions, including the appointment of bishops; this privilege became increasingly problematic as Rome sided more with the concerns of labourers and against the repressive policies of the regime. Recognised as a "perfect society" and a juridical personality, the Spanish Church received tax exemptions and government subsidies for salaries and the maintenance of cathedrals, parishes, religious orders, and other ecclesiastical institutions. Besides the financial benefits, the Church controlled family matters: Only a Catholic priest could consecrate a marriage; divorce, contraception and abortion were prohibited; and Catholic religious education was obligatory. The Spanish Church held the right to censure all educational material, while its own publications were free from state censorship. On its face, the Spanish Constitution of 1978 has also severed all ties between the state and the Church. Section 16, paragraph 3, declares, "No religion shall have a state character," Still, the Roman Catholic Church is the only religion to achieve some amount of formal constitutional recognition, as stated in the very next sentence: "The public authorities shall take into account the religious beliefs of Spanish society and shall consequently maintain appropriate cooperation with the Catholic Church and other confessions." One of the places where "appropriate cooperation" is most visible is in the matter of education. Paragraph 3 of section 27 guarantees the "right of parents to ensure that their children receive religious and moral instruction in accordance with their own convictions," a guarantee posted on the walls of many a parish [...] a service [!] that the state continues to pay for.